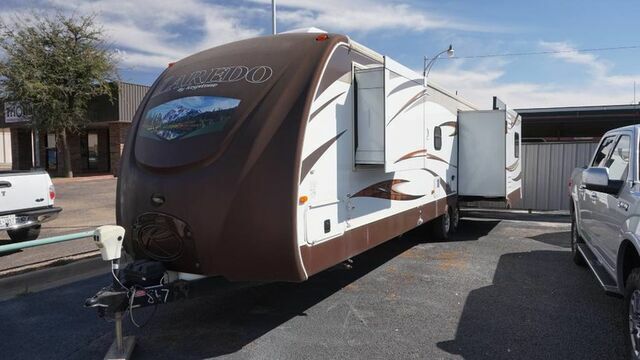 This Laredo 308RE travel trailer by Keystone is offered for sale at Classic Motor Cars. This 35' travel trailer features 3 power slide-outs, power awning, and power gliding HDTV. It has a very roomy living area furnished with 2 swivel rocker chairs, a fold out sleeper couch, large HD TV, and surround sound system. There are zones to the sound system; the radio can be played inside, outside, or both. The master bedroom is furnished with a memory foam mattress, slide out closet, and flat screen TV. The bathroom is equipped with a full sized shower, porcelain toilet, and a mirrored cabinet.